This engraved broken heart necklace can be personalized for the sweetheart in your life. Both sides of the split heart can be engraved with names, dates or a message of love. If you would like a heart engraved between names or on any line you can simply type the word "heart" into the desired location. The 2 piece broken heart necklace is also a wonderful gift for your best friend. How To Send Engraving Instructions: 1) After completing purchase go to "Your Account" on the Amazon homepage and click "Your Orders" in the drop down menu. 2) To the right of your order click "Contact Seller" in the yellow tab. 3) Send engraving instructions in a message. Please include text, font style, instructions/comments for engraving and/or product. 4) Double check and reread text to avoid typos. 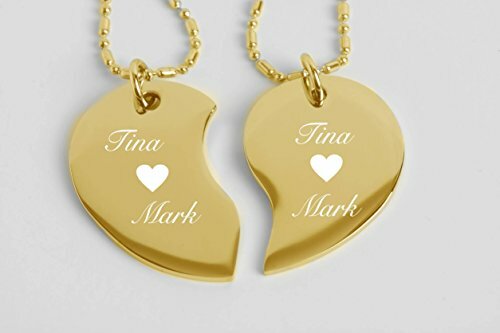 The Broken Heart can be engraved with any font style shown to the left of the product picture. *IMPORTANT* When customizing your order, please CAREFULLY review your customization order before you submit it. There is no way to review your engraving instructions after submitting the customization. Please review the font style and spelling for accuracy before checking out. Even though you may submit your custom order through the CUSTOMIZE NOW button, it's always good to confirm your engraving instructions with a follow-up message through Amazon's Contact Seller. If you have any questions about this product by aandlengraving, contact us by completing and submitting the form below. If you are looking for a specif part number, please include it with your message. Stainless Steel Round Box Chain 2.5mm - 24"
By William J. Hirten Co., Inc.